Sarah and Gabriel first met in high school. They had Economics together and Sarah had a crush on the cute football player with the gorgeous brown eyes and amazing afro, but it was not until they left those fluorescent-lit, locker-lined halls that they fell in love. The couple reconnected during a dance class that they were taking at a local community college. Sarah's dance partner dropped out and Gabriel waltzed back into her life. Five years later, Gabriel proposed on their anniversary and they married on July 30, 2016. 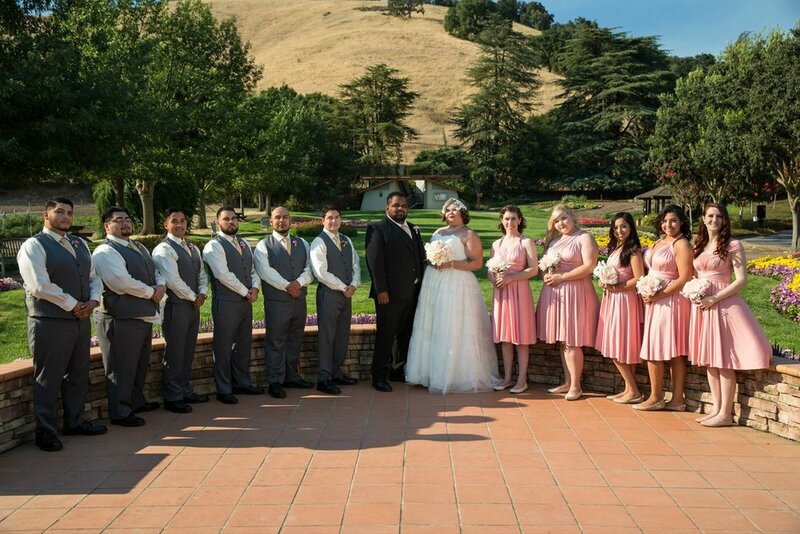 They chose to have their wedding at a historical venue connected to their favorite Italian/American Watsonville, Calif. restaurant. "We love the history of our hometown and chose to celebrate in a place that respected the history of our home," Sarah explained. They were the first couple to celebrate their wedding in the gorgeous, fully-restored 1930s ballroom. The bride's instagram: @fat.fem.flawless. The Groom's instagram: @sir_reel831. To respect the 1930s character of their venue, which had previously been a hotel, they chose vintage accents aimed at classic decor with nods to the present. Their colors were pink, red, gold, black, and white. Sarah used faux flowers for her and her bridesmaid's bouquets, which saved money without sacrificing color. Last minute, they did decide to add real flowers for their centerpieces with the help of Bridesmaid Esmeralda. The couple splurged on their sweetheart table. They used a rose gold sequined table cloth for the table, along with pink and white striped napkins and gold cutlery. Since Sarah and Gabriel take anniversary photo booth pictures together (a tradition that hearkens back to their very first date! ), they used different photo strips along with three facts about that year of their relationship as their table numbers. The bridesmaids all wore dresses from an Etsy store called "The Dainty Yard." Sarah explains, "I chose the dresses because my bridesmaid's were all different shapes and sizes and they offered a beautiful pink infinity dress that was available in plus and straight sizes that fit my theme and our budgets perfectly." 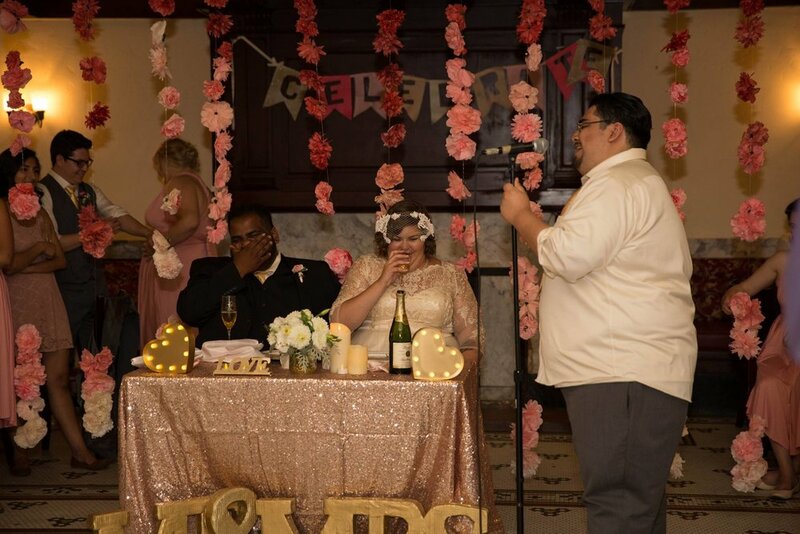 Sarah wore a David's Bridal dress for their ceremony and changed into a gold, lace ModCloth number for the reception that she scored for $50 on Poshmark. For her "Something Old," she accessorized her bouquet with a gold and pearl rosary that was given to her for her baptism. Her "Something New" were her shining, gold shoes (another bargain) from 6pm.com. She wore an heirloom quartz crystal necklace for her "Something Borrowed" and she actually forgot about both her "Something Blue" and her garters until three days before the wedding. Luckily, Amazon Prime saved the day and she scored some blue studded lace garters that fit thick thighs in the nick of time. Her ceremony veil was from HoneyPieBridal on Etsy and she made her birdcage veil that she wore for the reception. 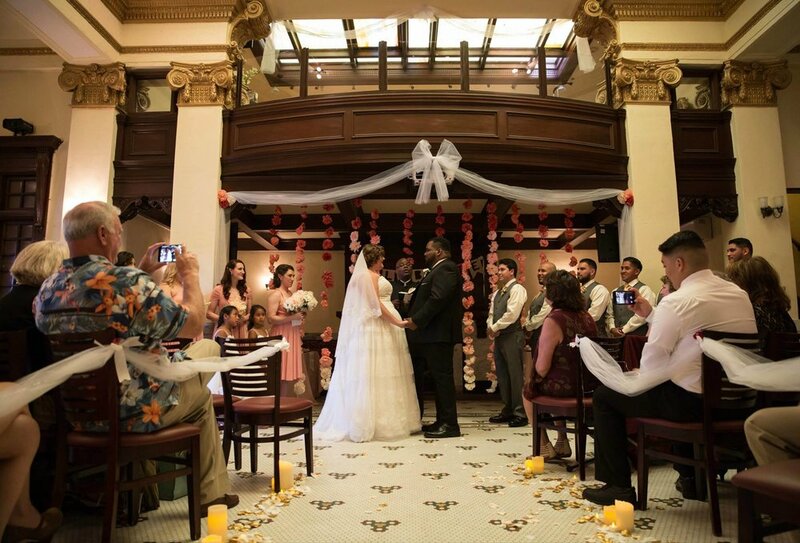 With vintage curls and a carefully curated outfit, Sarah walked down the aisle to Gabriel. They exchanged vows in front of 75 loving guests. Their ceremony was emotional, perfectly matching their serendipitous relationship. Their wedding parties worked hard to make the event beautiful on a $5,000 budget. 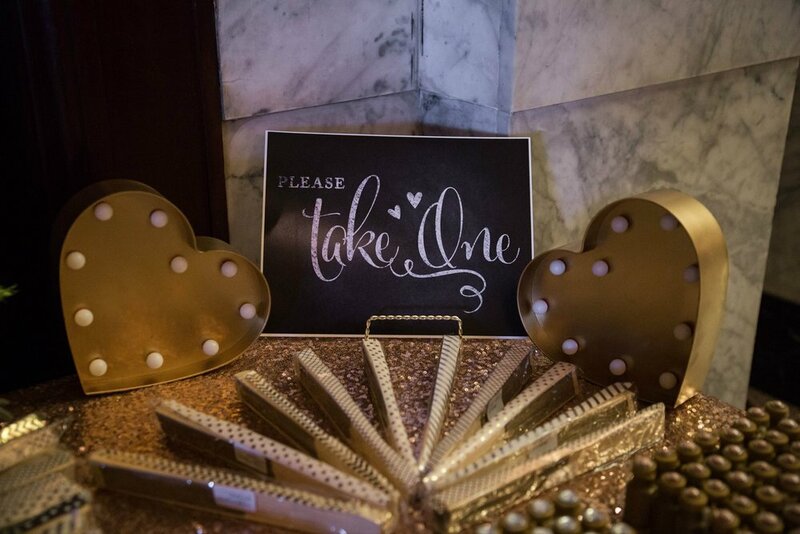 Many things were DIY'd, from folding napkins to the ceremony backdrop. 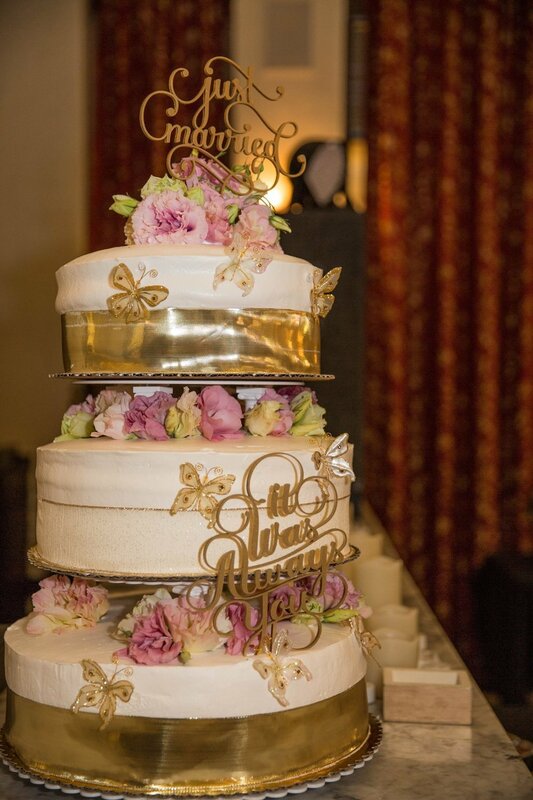 Their gorgeous cake, featuring freshly cut strawberries, was gifted by a close friend, Gina Casteneda. The couple wanted their guests to see how hard everyone worked to make the space their own vintage love story. Gabriel's favorite part of the evening was their reception because many of their friends are professional dancers, which made for a huge party when the music started. Sarah actually enjoyed the cleaning up processes the most, because all of their friends got together and cracked jokes while mopping up after a stressful day. Both of their favorite moments were when they could let loose with their closest friends. One of the most beautiful parts of Sarah and Gabriel's love story is their surname. Sarah wasn't thrilled with the patriarchal tradition of taking your new husband's last name and didn't want to lose the history either of their names held, so they decided to combine their names. Using Gray and Norwood, their new last name became Graywood. Sarah's advice to other brides are to remember that your wedding is YOUR wedding. "This weird thing happened where I morphed into someone else who was far more concerned with everyone else's opinion than I should have been. I got caught up in wanting everything to be picture perfect to the point where I forgot to take stock of the most important part of a wedding, which is being with people you love and who love you." Relationships with your friends, your family, and the person you're marrying is far more important than the party. A wedding is about the celebration of those relationships.